STAR TRACE Load Lifting Magnets are of robust cast and bolted or fabricated construction designed for handling Solid Slabs, Steel Ingots, Bloom Billets, Pig Iron, Light finished parts, Scrap and gives Maximum reliable, efficient and economical performance in the most arduous service condition. STAR TRACE circular load Lifting Magnets are of robust cast and bolted or fabricated construction designed for handling Solid Slabs, Steel Ingots, Bloom Billets, Pig Iron, Light finished parts, Scrap and gives Maximum reliable, efficient and economical performance in the most arduous service condition. Shells of Star Trace circular load Lifting Magnets are made from high permeability Steel Casting as per IS:4491(BSS-1617), properly machined, to provide the most efficient magnetic circuit. The periphery of the magnet is heavily ribbed to give added mechanical strength and an increased radiation surface to aid cooling. Center & Outer Poles are machine from high permeability magnet steel with cored recesses arrangement to protect heads of through tensile bolts. The faces of poles from spigot joints in magnet shell, the outer poles of larger magnets are skirted for added. The pole shoes are easily replaceable. 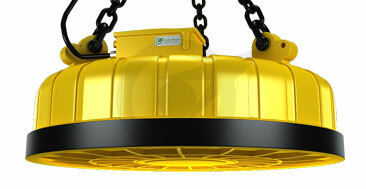 CIRCULAR LOAD LIFTING MAGNET TERMINAL BOX is designed to ensure protection whilst in operation and are of double entry type enabling the leads from the coils to be sealed in a separate cavity. The outside cable is brought through a gland into this second compartment ensuring no possibility of moisture entering the windings. CIRCULAR LOAD LIFTING MAGNET MAGNETIZING COILS for magnet size up to 900 mm dia is pure annealed wire wound and above these are strip wound. The glass insulation of class H standard with Fibreglass NOMEX tape forming an interlayer makes coil withstand high temperature. CIRCULAR LOAD LIFTING MAGNET BUMPING PLATES are of high grade Manganese Steel Casting as per IS - 276 with heavy ribs for added strength. These are clamped in position by the center and outer poles offering complete protection to the coil. The magnets are suspended with three legged STRING CHAINS made of best quality forged steel terminating in a forged ring. A two core cable is provided for connection with the supply and suitable insulated plug and socket ensure easy operation.